Last chance: 'Countdown' voting ends tomorrow! Hey drum corps fans! 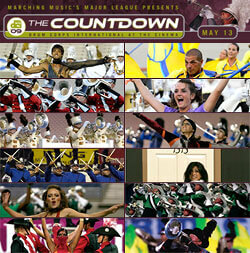 Though the final "Countdown" to the end of voting has begun, there's still time for you to cast your ballot to determine which six corps performances will make it onto the big screen when Drum Corps International's spring cinema event, "The Countdown," comes to theaters nationwide on May 13! Nearly 10,000 of you have already cast your votes, and even at this late juncture, all six finalist spots are up for grabs! YOUR vote could be the deciding factor that gives one of these corps the chance to advance to the big screen with a shot at claiming 2009 "Countdown" Champion honors. Voting will end at noon ET this Wednesday, March 11! Stay posted to DCI.org in the coming weeks for complete event information including a complete list of theaters and other important "Countdown" information! Coming to this event? Join us on Facebook!